I, um, uh, I mean, um, have no idea what you're talking about (averts eyes, drinks Diet Coke). I'll going to beam up now. I thought about using the obscene ones for ERA commons (the NIH grant site) because it's password requirements fit exactly ZERO of my current passwords, and it always takes me 20 minutes to come up with one that fits that I will actually remember. Which I never do. 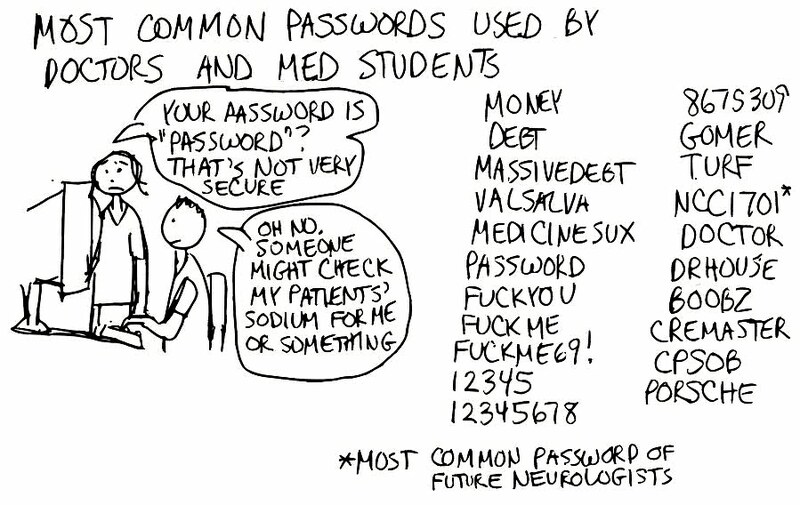 But then I worried that someone at the NIH might *see* my password, and not fund me so I decided against it. Way for me to stick it to the man, huh. Grump, I know you totally used that star trek one. Just admit it. Yeah, but YOU recognized it! So there! 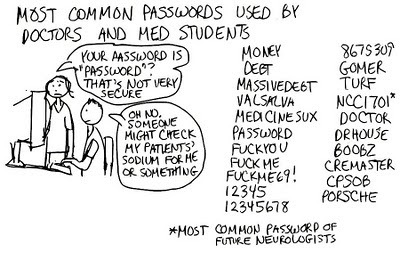 My favorite password was "medicine". But *I* had to look it up first. Oh good god, it looks like I AM doomed to become a neurologist! I guess 7 of 9 aptitude tests can't be wrong (no Star Trek joke intended, I really did take that many aptitude tests). Heh, Grumpy, OMDG, I didn't have to look it up. Oh, man, I am so screwed! Damn. That was really funny! I used excessively positive language for my work password. I thought it might help reduce despair during my toughest floor months. I was wrong.